Wow, it feels like I have been away from this blog forever and I pretty much have! Oopsie. >_> There's really no excuse for my absence other than... teh lazy. If you hadn't noticed, there was a pretty big focus here on talking about Guild Wars 2 content. So when my interest in the game faltered and I pretty much stopped playing GW2 altogether, it also led to less of an interest in writing about it and continuing making updates for this site. My sincere apologies if anyone was actively wanting to keep up with these posts. In other more awesome news though, I have finally forced myself to do something that I have been putting off for far too long, which is to create a YouTube channel! I still can't really believe it's real and actually a thing now. I've wanted to make videos for such a long time (we're talking years here), but kept thinking it was too complicated and that I'd never be able to do it. It also didn't help knowing I have a bad track record of starting things and then not following through with them for very long *cough* this site *cough*. So the idea of being a youtuber continued to be put off indefinitely. I won't go into detail but around three months ago, my world pretty much fell apart. Or that's what it felt like (and still does a lot of the time honestly...). I really needed something to take my mind off everything - a new hobby to focus on and escape real life for a bit so I thought, "Why not give this a try?" Even if no one else watched them, I figured things definitely couldn't get any worse as I obviously had 0 views, 0 subscribers, and 0 videos at the time. I literally had nothing to lose and potentially a lot to gain. 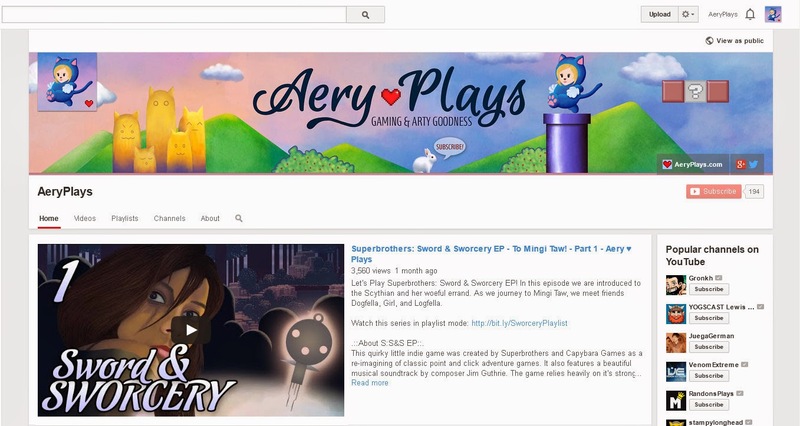 promoting the channel while trying to not appear creepy and desperate, etc. etc. Also, if you're in a similar situation and are thinking of starting a channel - please do it! Don't wait until you have the perfect setup or channel art or any other excuse you can think of. Just go and record yourself playing a game and have a blast. It will be worth it, trust me! What will happen with this website you might ask? Well, ideally I'd like it to sort of be a supplement to the youtube channel where I can post more in depth about certain things or provide extra bonus content of some sort. I'd still like to post updates about what my characters are doing in various games or news topics that might not really make sense to put in video format. In other words, I'm still figuring it out. But keep an eye out here as I definitely do not want to abandon this blog!